Morning has broken, like the first morning. Sod the Blackbirds. – The Diesel-Electric Elephant Company. Morning has broken, like the first morning. Sod the Blackbirds. Yesterday I moved my boat out of the marina and onto the canals proper. With the assistance of yonder The Bro, I moved up through the lock and a couple of hundred yards along. That is plenty for the moment, thank you, until I know more of my apex from my fundament. I haven’t spliced anything yet, and I don’t even know where my yard-arm is. A few days here and then I’ll move on. These moorings are more usually 48-hours only, but until the end of the month we are in CaRT’s “winter season” when most (including these!) are kindly extended to 14 days for the use of, weather etc notwithstanding. I’m notwithstanding at the moment, I am sitting down, typing this on my mobile wifi. I am pleased to report that both boat and I awoke this morning, still moored in the same place and both facing the correct way up. Moving yesterday was – completely against the grain of my life – a good decision, the wind today is gusting at about twice the speed of yesterday. The noisiest thing so far this morning, apart from myself, has been either the ducks or the birds nesting in the hedgerow alongside the towpath. Luckily for me, and all part of my cunning plan, is that I am already used to the shape of my personal space (fifty-seven foot by six foot ten inches), so climbing into my bed just two yards from a public footpath didn’t feel quite so strange as it may have done otherwise. In fact I slept rather well, only waking at four of the morning o’clock, when I took the opportunity to feed the stove some wood (which it didn’t actually bother to eat, I now discover). My view is, to one side, a wintery-green towpath and scrubby hedgerow, and to the other side across the canal, an open field of bean stubble with a horizon defined by leafless trees. The sky here is orders of magnitude larger than the sky available to me in the marina, and it is uncertain at the moment whether it is putting on pale blue happiness or fluffy grey cloud nonsense. The clouds appear to be winning the battle at the moment. I have had coffee (strong, very strong, French) and my dish of banana and cattle-feed (Alpen, to use the brand name). I am washed, dressed and feeling vaguely human. That said and this being my first day without the backup of a magic socket on a pontoon offering electricity should I need it, I would be happier if Mr Sun took his hat off decisively and put back the fifty-two amp-hours missing from my batteries for the past twenty-four hours’ usage. Nine o’clock in the a of the m, and ten percent has been replaced so far – plus running the laptop and phone charger. Today’s first outdoor task is to supplement my mooring ropes. I have one each fore and aft at the moment, on long diagonals, and these need the assistance of two more, shorter ropes, perpendicular to the towpath. With those we will be as secure from the elements as it gets. The Raytheon Phalanx installations on the roof will see to any marauders, in lieu of a hound (as yet). Let’s eat that nut-roast elephant one bite at a time. Actually, “nut-roast elephant” conjured up all of the wrong images, but you know what I mean. There are no monkeys on the Middlewich Branch of the Shropshire Union canal. As far as I know, anyway. So far. Who knows? There are boaters out there who won’t be happy until they have a wooden leg, some of them must have lost their monkeys over the years. Next Lazy, hazy, Sundays full of mooching around and reading, afloat. Have you replaced yer Sacrificial Anodes, Ian? And how are yer Anser Pins? I’m a new follower and looking forward to starting at your very first post and reading up to date. You can thank your sister for pointing me in this direction, promising a humorous and interesting read. She was right!!! Do you have a tin-opener? In case you’re attacked by a tin of wild pineapple? 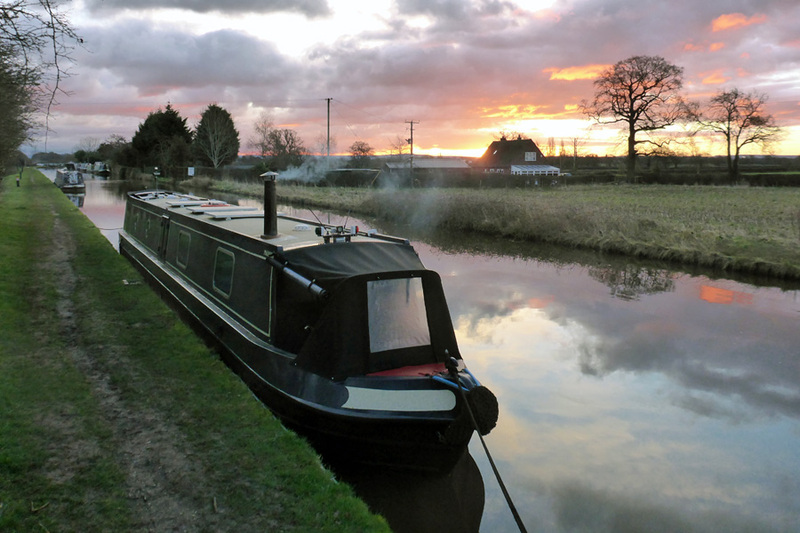 Ian Hutson lives a fascinating lifestyle on the canal system in England in his long, narrow boat pictured here. Thank you! Your reblogging explains the jump in my viewing figures – I was wondering where that had come from! My pleasure, Ian! I think there are a lot of people who are interested in courageous individuals who are living alternate lifestyles. I’ll echo Pat’s sentiments, Ian. I love learning about your lifestyle – it fascinates me! Once out of the marina, how do you recharge the batteries? I’ve got three large solar panels on the roof for the domestic batteries, and a small one that looks after the stgarter battery. As far as I can tell these should be a lot of what I need between March and November. At other times I will have to run the engine, that has two alternators on it, one for domestic batteries and one for the starter. I am still learning what and how and which combination will work best! Everything onboard is as energy-efficient as I can make it – LED lighting and that sort of thing. Right! I forgot about the roof solar panels. The boat operates a bit like my hybrid Camry – the gas engine comes on when the hybrid battery needs to be charged. The technology is just great. I hear you about your learning curve. I’ll look forward to future posts, Ian! I know I keep asking silly questions, BUT how do you tether (and to what) the boat in the middle of nowhere? I am in total awe of you and your adventures and may spend the rest of my life living it through your exploits! Don’t stop with the amazing photos especially of sun rises and sunsets. The sea looks calm today…..